Please note this is NOT a complete pattern: this is an EXPANSION PACK for my AquaAmi Sea Turtle pattern. 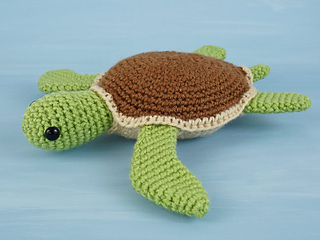 It includes all the modifications required to crochet a Sea Turtle much more quickly than the original AquaAmi Sea Turtle, with simple one-piece top and bottom shells. 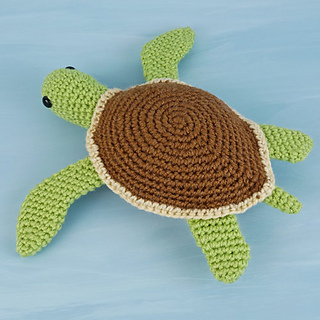 The result gives an ‘adult’ sized turtle that matches my Baby Sea Turtle pattern (sold separately). Yarn: worsted weight yarn in three colours (e.g. green, brown and cream as shown, or colours of your choice). 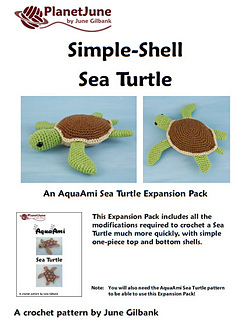 You can buy the AquaAmi Sea Turtle pattern together with this expansion pack at a reduced price here. 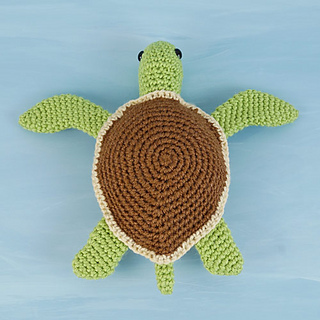 Or if you already have the AquaAmi Sea Turtle pattern, the pattern link on this page will let you buy just the Simple-Shell Sea Turtle Expansion Pack.